With influences such as "passion, Paris and chocolate" how could you not be completely swept away with MoRoCo Chocolat? 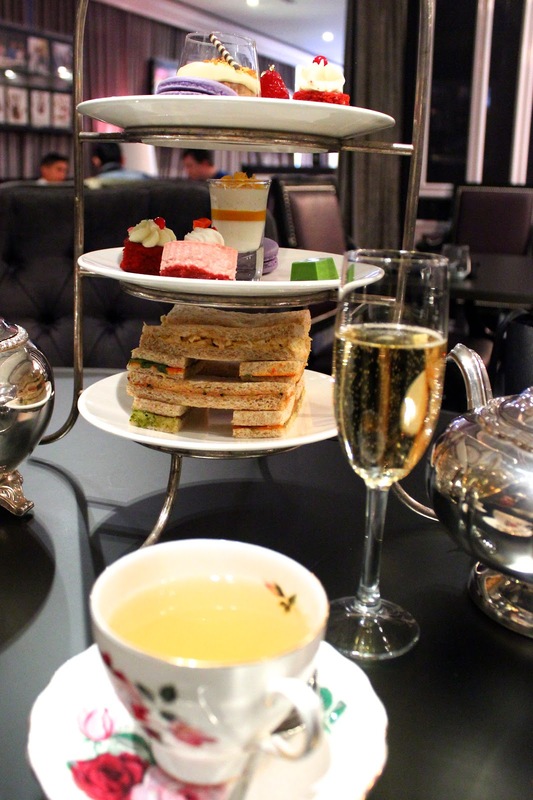 I had been wanting to visit this cheeky and luxurious Yorkville spot for a while now, so I was thrilled to accept an invitation to experience their lavish high tea. The boutique is whimsical, yet modern and it is stocked with colourful macarons, intricate little truffles and other confectionery goodness such as eclairs, chocolate dipped marshmallows, and peppermint-candy cane bark. The dining area is as glam as it gets- complete with draped walls, sparkling chandeliers and posh seating. At a closer look you will discover the vintage tea pots, and high gloss white rabbit antlers, which allude to a Parisian chic meets Alice in Wonderland theme. The decor is fabulous, while the food is crafted to match. To start the experience we chose our teas from a variety of artisan blends. I went with a fruity "Strawberry Fields", and B chose a more decadent option "After Eight" - a chocolate mint Rooibos blend. Next came our glass of champagne and our very own three tiered dessert stand. The bottom layer was stacked with mini sandwiches. And we're talking gourmet spreads such as mango- chicken and pesto-smoked salmon! The top two tiers were filled with delicious pastries- red velvet cake, cassis flavoured macarons, vodka infused truffles, mini cheesecakes, and the list goes on! Don't even ask me what my favourite was because I still can't decide. Each bite was an adventure of it's own and the pure flavours had me wide-eyed and amazed. Warm, freshly baked scones came out about 15 minutes after the nibbling began. I immediately went for the chocolate scone, which was actually unreal (may just be my favourite! ), while B devoured the original scone with lemon curd. Just when we thought we were done, the savoury dishes were brought out. Truffled mac and cheese for him, and a sweet potato quiche for her. Both were filled with flavour, and even though we were bursting at the seams we managed to polish them off. 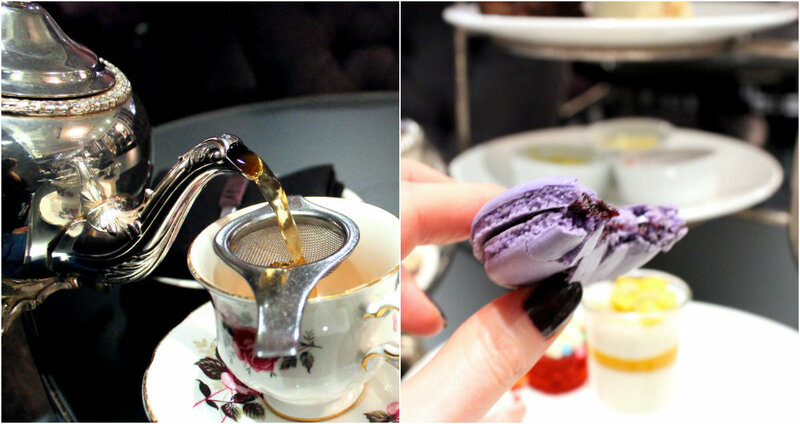 MoRoCo Chocolat is truly an inspired place that takes you to a Parisian wonderland and engulfs you in every bite. They make everything in house in small batches and it's evident they use the highest quality of ingredients. Whether you're planning an afternoon tea, a dinner date or want to indulge in the sipping chocolate and macarons, it is necessary that you experience MoRoCo Chocolat. *A huge thank you to MoRoCo Chocolat for this insanely sweet experience! MoRoCo Chocolat is located at 99 Yorkville Avenue, in Toronto.